monkey artist's also bring joy. I just love silliness and fun, and you just have such an open-mind, I just wuv your work. Thank-you for your imagination, it is a beautiful thing and wonderful world to live in, pure wonderful imagination. You are very welcome, seahorse! I chuckled at your Avatar with Easter ears and "rolling eyes", so funny, reminds me of your Thanksgiving friends. AYC, would you mind looking at my avatar: could it be sized a little bit larger and possibly with some animation with the butterfly or Woodchuck's little wing or eggs or something. Also, I tried to change to another one of the new ones you made me for this year, but it wouldn't load - a message said it was too large for the server? Anyway, it was the purple egg with the darling bunny outside of the egg with the big eyes and cute, floppy ears. Click "Change Profile" button at the bottom, and it should work fine. I recognize your avatar you are using now. I animated it for you three Easters ago. Here is the old animation I made a few years ago, along with a new one I did tonight. Here is another one I made tonight for you. Thank you! So much! I love everything you do. Thanks, too, for the new one on the flag...I "love" it...I actually have a collection of flags I use outside my home...not Snoopy flags, but I do have a real cute Bunny flag for Easter. You're always very welcome, Puzzler! I felt like Fancy might like a few eggs in her portrait for Easter. You're so kind to all of us in sharing your many talents...can't thank you enough! The next mass posting I will be making is for Fourth of July avatars. 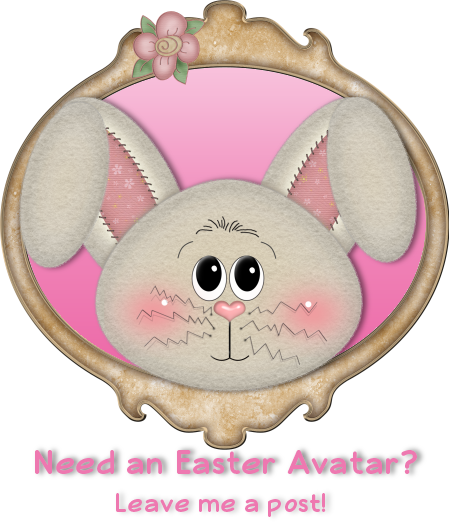 If you would like a Spring or Summer avatar let me know and I'll make you one. 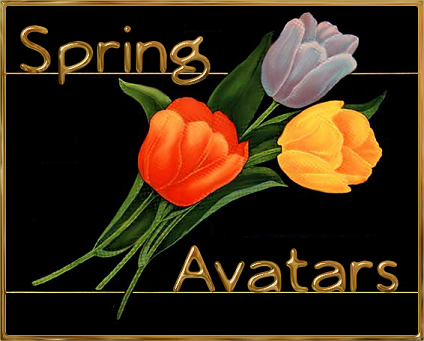 I posted some Spring avatars along with some of the Easter avatars this year. They can be found starting here. Just leave a post and I'll leave a design for you! Here is a non-Easter sig line image for you if you like. I see you in the rafters. Just made this for you without the eggs in case you'd like to use it now. Will be happy to design whatever you like as well. THANKS SO MUCH!!! I was looking to see what was next!!! You make me sooooo bee-u-ti-ful!!! I just love coming to look at all you have done!!! I love shopping for Jamms...it is so much fun to see what you come up with and AMAZINGLY appropriate to each poster!! I am SO IMPRESSED with your talents!! I look forward to the next little shopping spree I get to go on with you!!! I am changing out of the Easter eggs now!! Thanks again!!! and I hope you had a wonderful Easter!! I got to spend it with 2 of my granddaughters and my wonderful hubby!! It was just awesome!!! Jamms, if you have any ideas of what you'd like for Spring/Summer, just let me know. I am more than happy to come up with a brand new design for you! Brandi, I am a BEACH LOVER so anything with a beach is perfect!!! I love the palm trees and the white sand..me and hubby are planning a trip to pink sandy beaches for the summer...after this trial..and that would be awesome! I love all the detail and animations you do for all of us!! And I trust your judgement on what to pick!! Thanks for all the work you do and the time you spend getting the "character" of each avi so perfect!! In case you forgot..PINK is my favorite color!! LOL!!! Anything you do will be wonderful to me!! I adore your talent!!! Thanks a bunch!!! Sounds like you are ready for summer!